after two months here, i've found some seriously brilliant local designers. 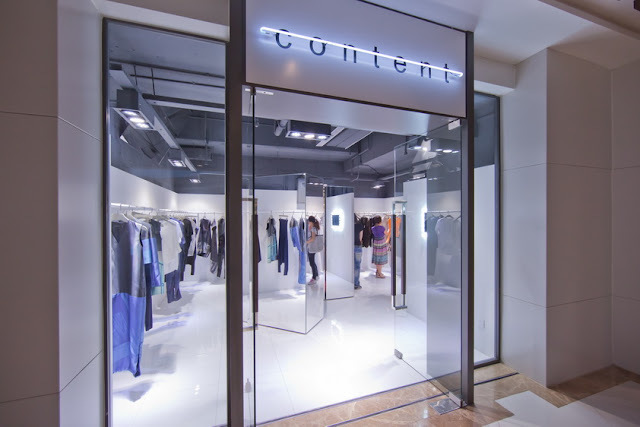 more posts on some of the amazing talent in the next weeks, but this month's shop talk post is about Content, one of my favorite boutiques in Shanghai. the Content girl is a fearless urban avant-gardist with perhaps a degree in media studies, and an abiding love for the sharp, dramatic silhouette. however, she could just as well be a quiet but powerful dresser, a devotee of intelligent and inspiring design. really, anyone with an open mind for experimentation and an appreciation for well crafted clothes could find something wonderful here. there's a bit of Helmut Lang and Rick Owens scattered throughout the designs, though the overall pieces stand on their own with the unique imprint of the designer's take on "clothes as a form of media" in the urban landscape. 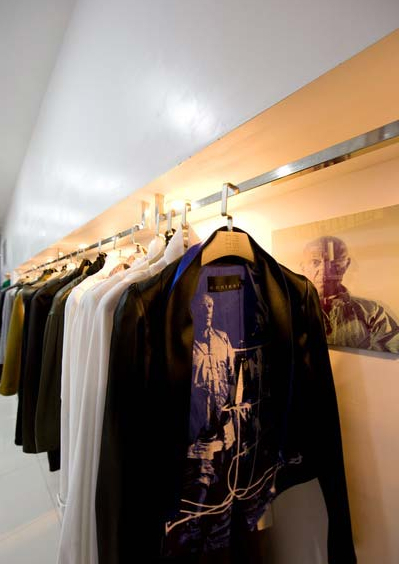 unlike some edgy stores, you don't have to do a 'total look' to find a wearable gem to add to your existing wardrobe. one of the strengths of the collections is that there is an evenly executed focus on fabrics, tailoring, and concept. colors are mostly muted neutrals, though there are some gorgeous colors this season (mostly blues and oranges). many of the pieces – like the overcoats, blouses, and blazers – are expertly tailored with unique wool, cotton, and silk or natural/synthetic-blend fabrications. prices and fabric content are clearly labelled, which makes the browsing experience much more pleasant (you'd be surprised how often this is not the case even in pricey shops in Shanghai...). i tried on a dove-grey wool blanket coat with an asymmetrical, Rick Owens-esque drape collar that fit perfectly at the shoulder and slim (but not too slim) through the sleeves. for someone who isn't normally swayed by expensive outerwear, this coat was seriously tempting. 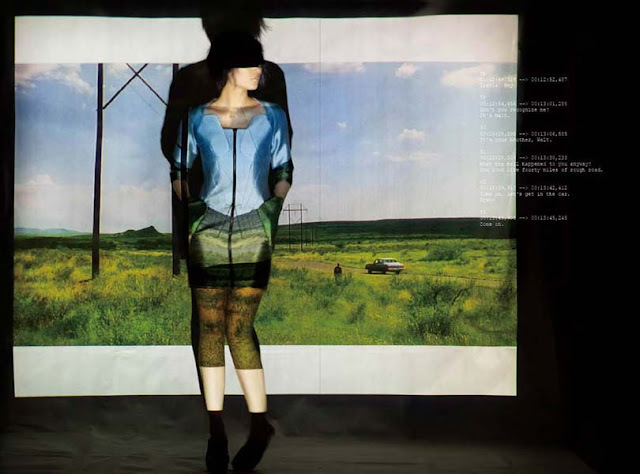 true to the brand philosophy of clothing as a vehicle for media expression, screenprints of film and photographic images are also a signature design element at Content, adding another witty layer of visual texture. 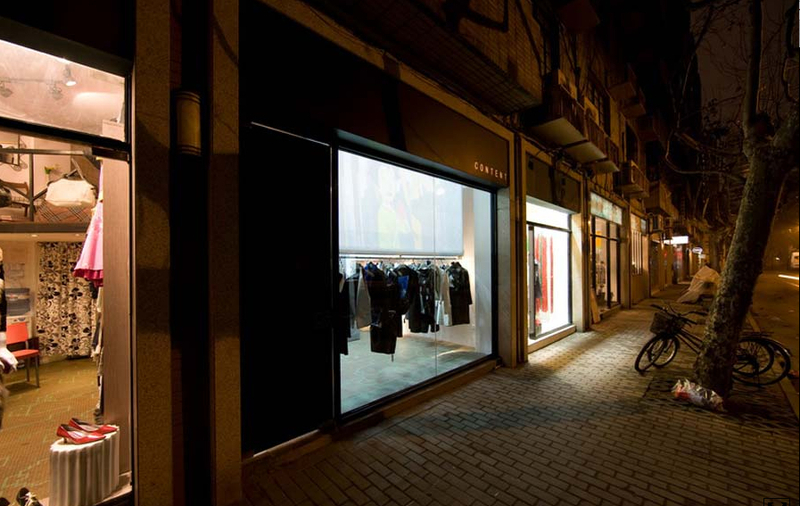 as with many shops in Shanghai (regardless of high or low-end), sizing runs small. the available sizes are S, M, and L, and there are often only one or at most a handful produced of each style. for reference, the M fits me just right as i have broader shoulders than the average Shanghainese girl with my build, which for better or for worse reflects the typical anti-vanity designer sizing practices here. 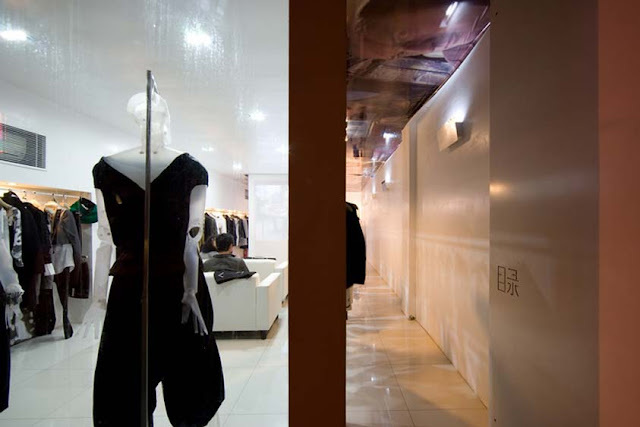 however, you also have the option of getting something tailored-to-fit, or doing a custom order. i love that about many designer shops here. I;m really enjoying your tales of Shanghai, and love that you're bringing all these local brands I probably would have missed on my usual 4, 5 day visits to Shanghai (my father worked in Shanghai and I visit from time to time). I do agree that Chinese clothing sizes run small - a jacket my father bought for me in large was way too tight and I had to give to a cousin. @lin thanks :) if you're ever in Shanghai this next year, definitely email me and let me know! would be lovely to meet up and do some shopping together! yeah in the other times i've been here i've known about how small the sizes are, but it never really ceases to amaze me every time. at uniqlo the other day, i was looking at jeans and the size range started from size 22 and only went as far as 28! :P i thought size 24 denim was a mythical size for tweens, so the fact that size 22 denim exists is just a whole other parallel universe!